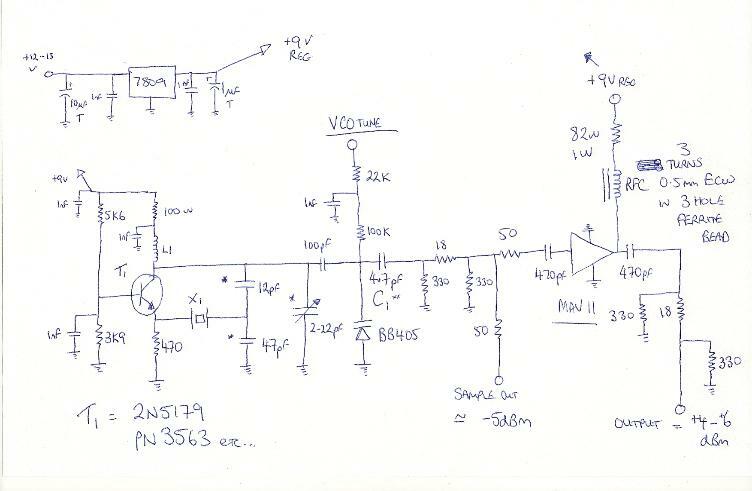 VK3NX " Favourite Local Oscillator"
My "favourite" Local Oscillator circuit. LO for microwave multiplier chains. referrenced to a 10 MHz GPS derived signal. but the newer TOKO coils in the shielded cans work very well. - the ratio of 12pF to 47pF caps can be altered. crystal should pull > +/- 60 Hz. chain. This level also works well into other multipliers. stable and less subject to any pulling and any other such effects. 1nF bypass capacitor across the emitter resistor on the 2nd stage.